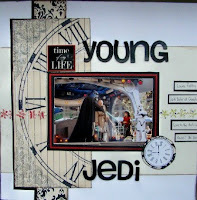 Its time for the January Kit reveal at Scraptivity! 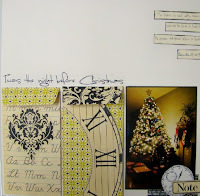 All the layouts and projects were created using only the products in the January Kit. What do you do with the ticket stubs from events, shows and games? Well mine usually end up in a drawer somewhere. Not any more. 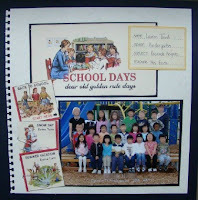 This mini album was super easy to make using envelops and some gaffer tape. Now my tickets have a home and a little hidden journalling to go with it! One of the inside pages. All the envelops open up and inside are the tickets and a piece of journalling. LOVE the October Afternoon Report Card line. Here is some more of the October Afternoon Report Card line with some Teressa Collins Documented line. The envelops contain the pictures and notes that the girls left for Santa beside the plate of cookies. Our very own Jedi! This is my take on the January Kit Sketch. 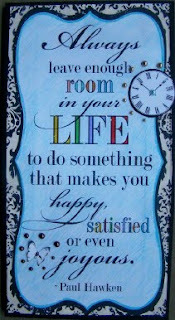 The quote is from Teressa Collins Documented line, and it is a great addtion to the wall in my scrap space. Check out the rest of the design team's work here. Love the layouts. Especially the ticket stubs mini album, great idea! 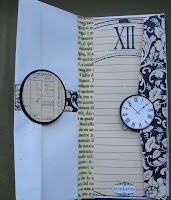 That paper line is beautiful, with the damask print and roman numerals. Also, totally agree with the quote!